The evolution of possible new logos for the Hamilton County Department of Education, created by the Johnson Group. The school board will consider a name change - to The Public Schools of Hamilton County in January. Hamilton County Schools Superintendent Bryan Johnson's $100-plus million plan for schools got a thumbs-up from the Hamilton County Commission. The Hamilton County Department of Education may be getting a new name — The Public Schools of Hamilton County. Superintendent Bryan Johnson asked the school board at a work session Thursday night to add the name change to the January meeting agenda. 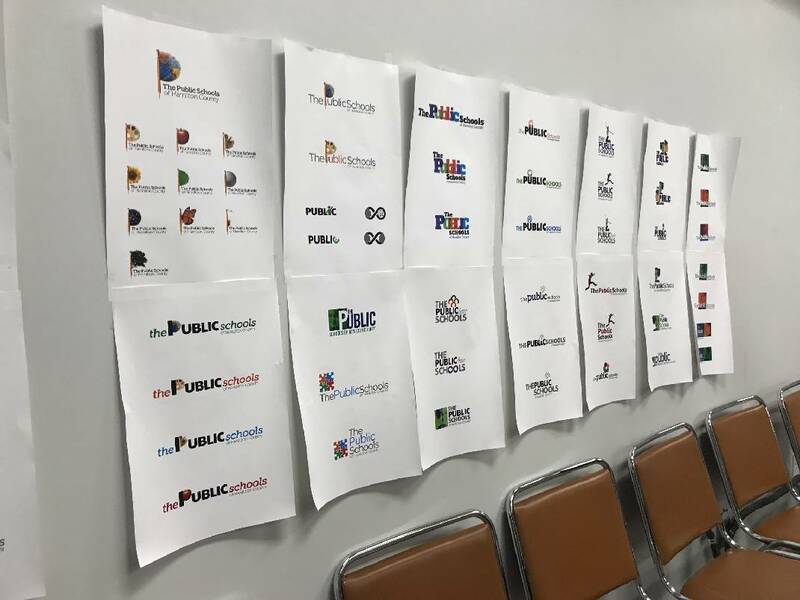 Since August, the district has been working with local firm Johnson Group (no relation to the superintendent) on a proposed rebranding and logo change, an idea Johnson originally brought to the board when he took over the position in June. 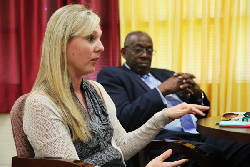 "We are long overdue for a rebranding," said District 4 board member Tiffanie Robinson. "I've been a supporter of HCDE doing a better job branding itself, and the reality is if we want a better image, we can only do that in a rebranding." "If you want people to believe in our school system, it has to do with a better image and branding ourselves in a better way," she added. The name change would come with a new tagline, "Open to All. Open to All Possibilities," new logos and a new website. 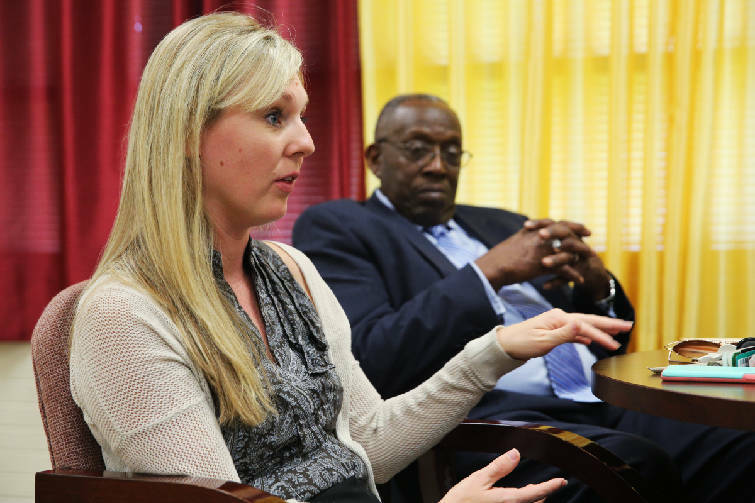 District 4 Hamilton County School Board Member Tiffanie Robinson talks about the benefits she hopes will come of the new literacy initiative at Howard School in Chattanooga, Tenn., on Monday, Nov. 6, 2017. If the initiative is successful at Howard, she hopes to see some of the same ideas spread to other schools across Hamilton County. The emphasis on the "public" part of public schools is intentional, according to Joe Johnson, president and CEO of the Johnson Group. "We need to own who we position against," he said. "There are private schools and there are public schools. A lot of public schools have had a bad reputation, [and] part of it is because of the communication that goes out. We need to own the fact that we are public schools." The district now pays about $65,000 a year for its website. A request for proposals for the new website has been sent out, with 10 vendors answering it, according to the district. Officials have narrowed down the vendors and will present their recommendation to the board for approval in January. The Johnson Group has provided its services at no charge thus far, according to Bryan Johnson. "What he has charged us so far is a bargain, because he is doing this out of service to the community," joked board Chairman Steve Highlander. Some of the possible logos for the rebranded Hamilton County Department of Education as designed by the local Johnson Group. To actually change the district's name, the board must vote on the issue as an agenda item at the next board meeting. Other highlights from Thursday's school board meeting: The board approved Bryan Johnson's request to add a new position — a chief equity officer. The current director of student services, Marsha Drake, will be elevated into that position, which will oversee the district's equity efforts as well as other student services such as social work, counseling, homeless services and English language services. In a partnership with Chattanooga 2.0, the Chattanooga Area Chamber of Commerce, the Tennessee College of Applied Technology and Chattanooga State, the district plans to launch Future Ready Institutes at the district's high schools. Next year, ninth-graders will be able to choose from career-theme focused institutes such as advanced manufacturing, health sciences and business based on their aptitudes and interests. The institutes will incorporate career and technical education with traditional courses, according to Blake Freeman, who is heading the initiative. The district plans on interviewing architect candidates for five capital projects in mid-January. A short list of five architects who answered the district's requests for proposals has been compiled for five of the projects approved under the $125 million capital plan approved by the board in October. Those include new East Hamilton Middle and Harrison Elementary schools, an addition to Snow Hill Elementary, the renovation of Howard Middle, the renovation of the current Tyner Middle building for the Chattanooga School for the Liberal Arts and the merger of Tyner Middle and Tyner Academy. The "Mid Year True Up," or the budget department's mid-year budget amendment adjusted to reflect board decisions, was accepted and approved. The mid-year budget can be found at https://tinyurl.com/ybysfzjb. Superintendent Bryan Johnson announced that an organizational chart reflecting staffing and role changes under his administration is forthcoming and should be available for the board as soon as Friday.